Sometimes smaller can be better. And that’s the case with Mohu’s Leaf Metro paper-thin HDTV antenna. Leaf Metro delivers great range in a small, discreet package. This compact HDTV antenna is perfect for city dwellers, dorm rooms, workshops or just about anywhere you go like in your RV or tailgating before the game. All antennas are based on physics. Leaf Metro is the smallest size possible for high quality reception. Borrowing from the same advanced U. S. Military technology built into its bigger cousins – Leaf 30 and Leaf 50 – Leaf Metro reaches out in a 25-mile radius from your home to bring you the most popular TV shows, news and sports, on both network and local television in full 1080 HD – for FREE. No need for cable or satellite fees to watch stations like PBS, ABC, CBS, NBC and Fox or your favorite local channels. Add an amplifier to your Leaf Metro and reach up to 45 miiles according to our new testing. Paper-thin design delivers full 1080p HD to any digital-ready television. There are no exposed or distracting antenna parts. The reversible black and white design can also be painted to match any décor. Leaf Metro’s unobtrusive design is so compact it can easily be hidden out of view. Unlike other antennas, all Mohu antennas come with a separate coax cable, allowing you to position your antenna in the most convenient location away from your TV. Depending on what’s broadcast in your area, you’ll soon be able to watch popular national TV networks and local TV shows at no cost. With Leaf Metro you no longer have to pay high monthly cable or satellite bills to enjoy your favorite shows. Leaf Metro can pull in all of your local news, weather, sitcoms, kids and sports programming with NO monthly contract or bills. 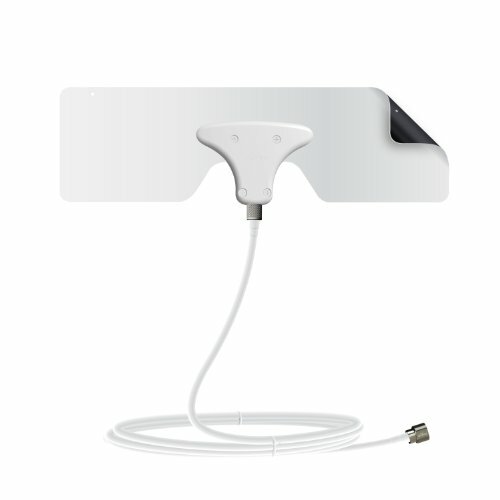 Multi-Directional and Reversible HDTV Antenna: Paintable to match any decor no pointing" needed and comes with included 10 ft. high performance cable"
TV Antenna Designed and Manufactured in the USA with a 1-year Warranty. Before you buy, visit gomohu dot com backslash amazon to see what channels are available in your area. If you have any questions about this product by Mohu, contact us by completing and submitting the form below. If you are looking for a specif part number, please include it with your message.